This is a rough and tumble drive down King Street. Looks like you need to stay to the right! This photo was taken from the corner of King and Annapolis. I’d say it’s from the 1950s. On the right are some newly-built bungalows, to the left is land that still hasn’t been developed yet. King Street was originally the way out of town. It led to the King’s Canyon road, which took you up the mountains and into Lake Tahoe. It was part of the Lincoln Highway, the first transcontinental automobile highway in the United States. Later the road to Tahoe was moved to Clear Creek Canyon instead, where it still is today. King’s Canyon road stayed passable until recently, but it has deteriorated too much to be driveable anymore. King Street, though, has come a long way. After the highway moved south, this became a residential road. 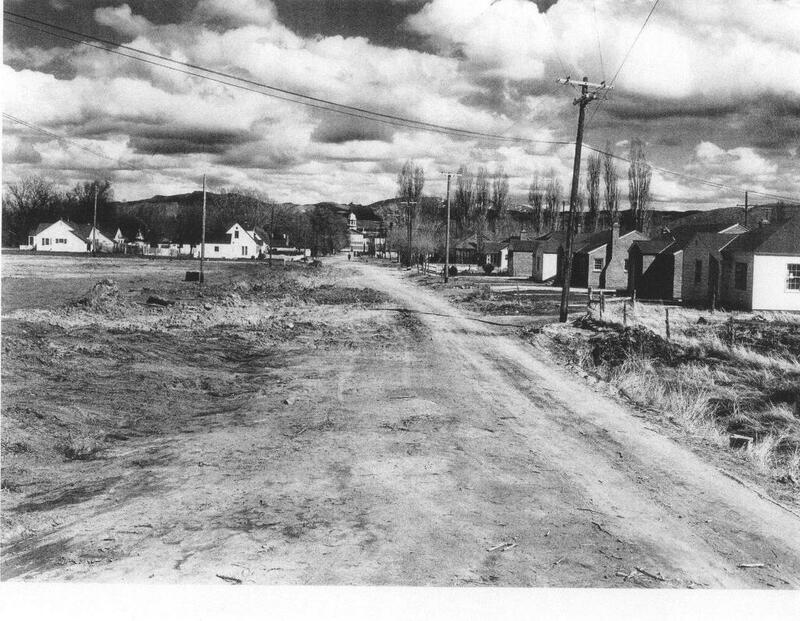 The ranches that used to be out in this part of town were subdivided and sold off as housing. This view shows some older neighborhoods in the distance on the left, newer houses on the right, and undeveloped land on the near left. The road seems to be in particularly bad shape; maybe it’s in the process of being regraded. King Street used to go all the way to Carson Street, with the Capitol acting as a welcoming beacon to downtown. In the 1930s the Supreme Court Building was built in the middle of the street, cutting off King Street one block short. The white gleam of the Supreme Court can be seen at the end of the street, with the Capitol dome rising over it. Several decades of development have seen this part of town fill in quite nicely. The “new” bungalows on the right are still there, now classic mid-century homes. The field to the left has been fully built out, with houses that are getting to be a few decades old themselves. King Street is completely paved and suburbanized. Two schools are right here, Bordewich-Bray elementary and Carson Middle School. 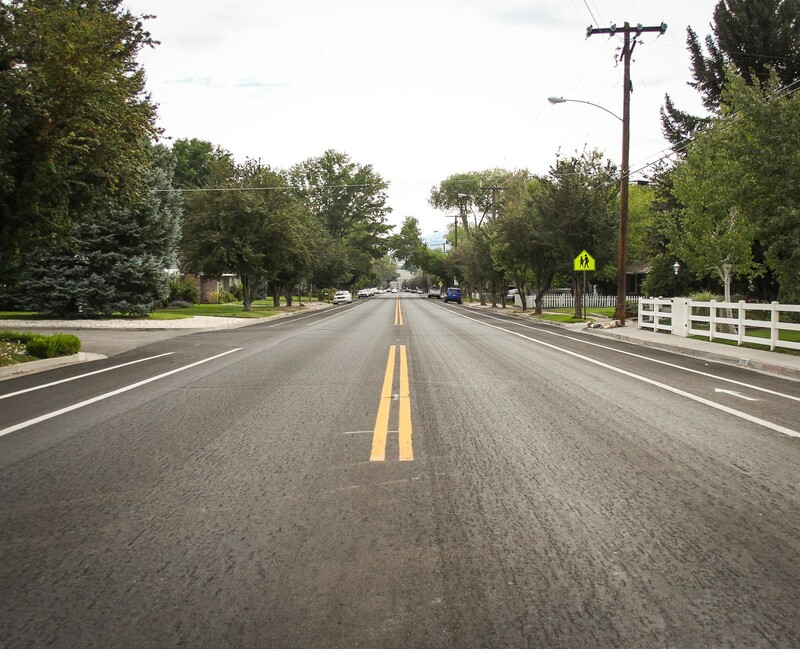 For much of the year the speed limit is 15 MPH because of the school zone. 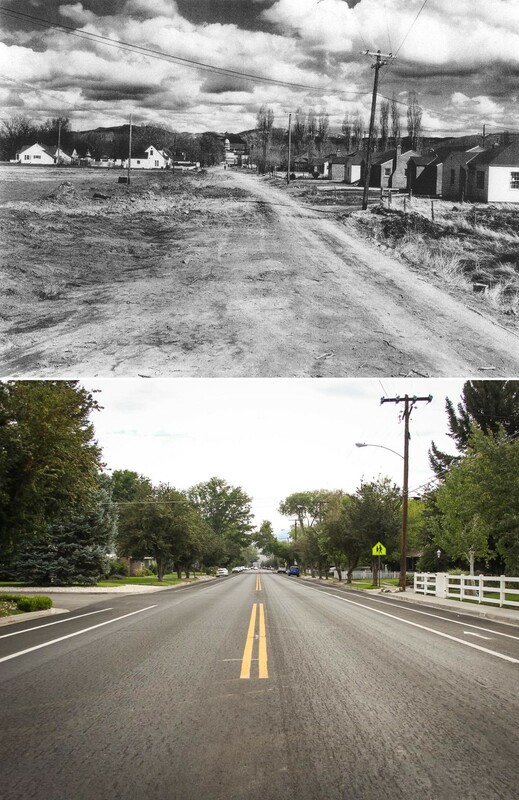 Lawns and trees have grown in, and this is considered one of the old neighborhoods of Carson City. It’s come quite a way since the dusty days of bumpy roads.